All rooms have wood floors, design bathroom, flat screen TV with international channels, double bed, Individual air conditioning and heating controls, complimentary minibar, rain effect shower, Molton Brown toiletries, hair dryer, slippers, Twice daily housekeeping service with complimentary water on turndown and laundry service. Some rooms have a balcony, designer bathtub or twin beds. Please notify us in advance of any special requirements you might have. We can provide guests with baby cots and extra beds. All our rooms features all modern necessities, flat screen TVs and en-suite showers but none of our rooms have any windows. Together with our interior designers we have created light sources that creates an atmosphere of relaxation. Our rooms are designed for relaxing and sleeping in, we have taken every aspect to ensure you will be happy with your stay. Contemporary room featuring a comfortable single bed and a small writing desk. Equipped with all modern necessities with an en-suite shower. 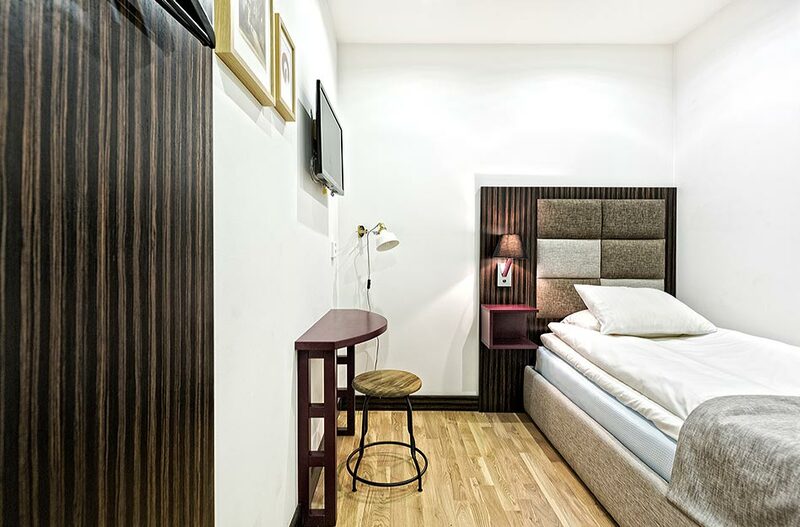 Contemporary room featuring a comfortable double bed and a single bed, and a small writing desk. Equipped with all modern necessities with an en-suite shower.